Anthony Mackie may be joining his The Hurt Locker co-star Jeremy Renner in the Marvel Universe. 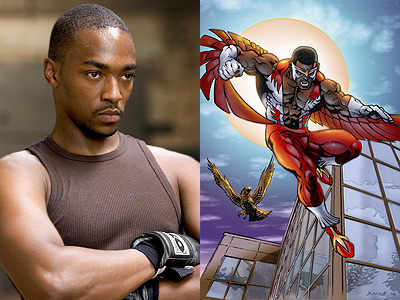 Mackie is in talks to play the Falcon, one of mainstream comics’ first African-American superheroes, in the upcoming sequel Captain America: The Winter Soldier, reports THR. Marvel also has plans to reintroduce the character in an upcoming animated series called Avengers Assemble. Falcon has the ability to see through the eyes of his bird Redwing and fly using a wing harness. Mackie was most recently seen in Abraham Lincoln: Vampire Hunter and co-stars in the upcoming ensemble crime drama Gangster Squad. He will join Chris Evans who reprises his role as the genetically modified super-solider Steve Rogers aka Captain America. Joe and Anthony Russo (You, Me and Dupree) will direct the second installment. The sequel will pick-up where the highly anticipated Marvel’s The Avengers leaves off, as Steve Rogers continues his affiliation with Nick Fury (Samuel L. Jackson) and S.H.I.E.L.D and struggles to embrace his role in the modern world. Captain America: The Winter Soldier is slated for release on April 4, 2014 in 3D and 2D theaters.